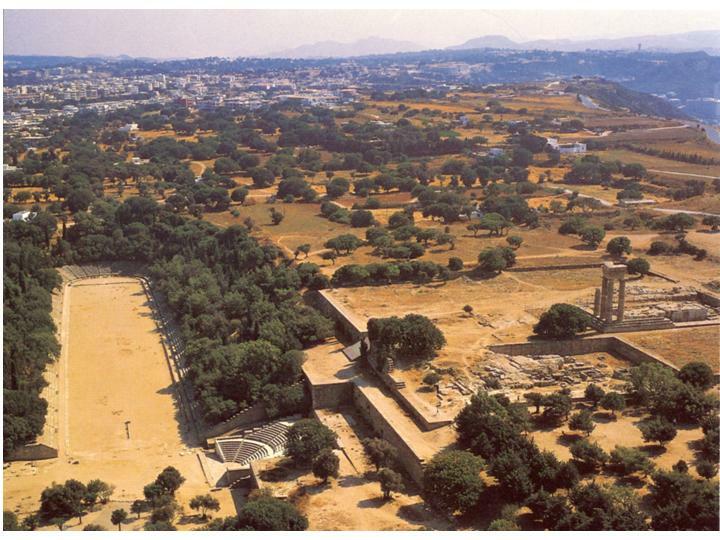 The Odeion is located on the ancient acropolis of Rhodes, north of the ancient stadium. Both monuments were restructured during the period of Italian rule. The Odeion is an elegant theatral structure lying on the east slope of the hill of the acropolis and inscribed in a rectangle. The excavation of the monument brought few architectural elements to light, but they were enough to lead to its secure reconstruction. The cavea is set between two side walls, orientated east and divided into an upper and a lower cavea. The lower cavea is divided by four staircases into five cunei with ten rows of seats. 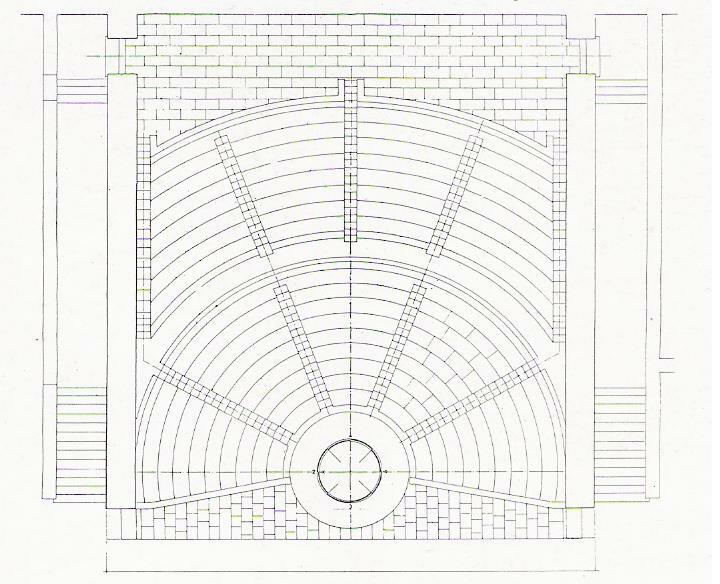 The two endmost cunei are delimited by the parodos retaining walls, which converge on the orchestra, 5.50 m in diameter. The thresholds of the doors leading to the parodoi are preserved in situ, at right angles to the stage building, sections of whose foundations were found during the excavation. There may also have been a logeion in front of the stage. The upper cavea consists of four cunei with nine rows of seats, separated by three narrow staircases. Outside the cavea and parallel to the two side walls run two paved ramps, 2.20 m wide with stepped ends, which led to the upper part of the odeion. Doors (the threshold of the south door remains in situ) provided access to the space between the upper cavea and the retaining wall, which delimited the monument on the side of the acropolis hill. The Italian architect M. Paolini posited the existence of a Doric stoa at this point. The Odeion, with an estimated capacity of 800 people, formed part of the complex of the Gymnasium of the acropolis of Rhodes, which was intended for the education of youths and had an important library, known to us from inscriptions. Obviously it is not identified with the large theatre of the Hellenistic city, which, according to literary sources, was near the south part of the fortifications but has not yet been uncovered. 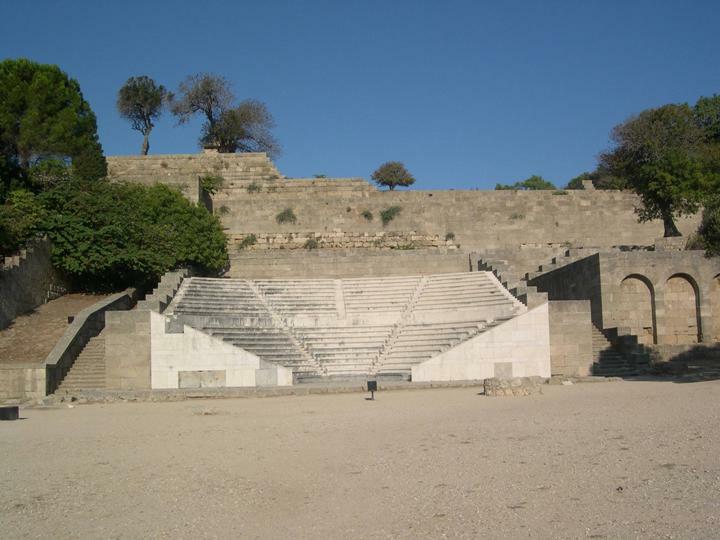 formed part of the Gymnasium of the acropolis of Rhodes. The record and restoration plans and drawings by architect M. Paolini are published inM. Livadiotti – G. Rocco (eds), La presenza italiana nel Dodecaneso tra il 1912 e il1948, Catania 1996, figs 48-52. The archive of plans and drawings is held at the Italian School of Archaeology at Athens. Photographs of the Italian Photographic Archive are held in the archive of the Archaeological Institute of Aegean Studies. Photographic records are held in the Archive of the 22nd Ephorate of Prehistoric and Classical Antiquities. G. Jacopi, Attività del Servizio Archeologico a Rodi, Bolletino d’Arte VII, s. II, 1927-28, p. 517, fig. 7. L. Laurenzi, I monumenti dell’antica Rodi. Il teatro di Monte S. Stefano – I, Memoriedell’Istituto Storico-archeologico FERT, II, 1938, 26-29, pl. XVII-XXVI. M. Livadiotti – G. Rocco (eds), La presenza italiana nel Dodecaneso tra il 1912 e il 1948, Catania 1996, 23-26.W. Hoepfner (ed. ), Antike Bibliotheken, Mainz am Rhein 2002, 68-72, figs 91, 94. On the ancient acropolis of Rhodes, north of the ancient stadium. The Odeion was restructured during the period of Italian rule. The Odeion is an elegant theatral structure lying on the east slope of the hill of the acropolis and inscribed in a rectangle. The excavation of the monument brought few architectural elements to light, but they were enough to lead to its secure reconstruction. The cavea is set between two side walls, orientated east and divided into an upper and a lower cavea. 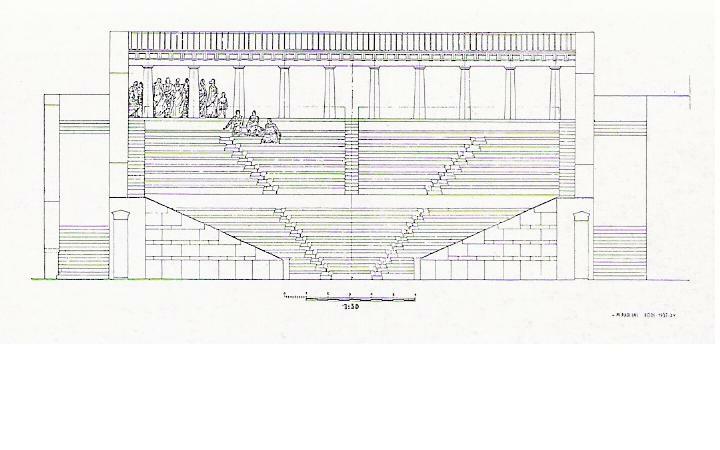 The lower cavea is divided by four staircases into five cunei with ten rows of seats. The two endmost cunei are delimited by the parodos retaining walls, which converge on the orchestra. Sections of the foundations of the rectangular stage building were found during the excavation. The upper cavea consists of four cunei with nine rows of seats, separated by three narrow staircases. Outside the cavea and parallel to the two side walls run two paved ramps with stepped ends, which led to the upper part of the odeion. Doors provided access to the space between the upper cavea and the retaining wall, which delimited the monument on the side of the acropolis hill. The Odeion, with an estimated capacity of 800 people, formed part of the complex of the Gymnasium of the acropolis of Rhodes, which was intended for the education of youths and had an important library, known to us from inscriptions. Obviously it is not identified with the large theatre of the Hellenistic city, which, according to literary sources, was near the south part of the fortifications but has not yet been uncovered. The monument was identified by A. Maiuri in 1916-17. 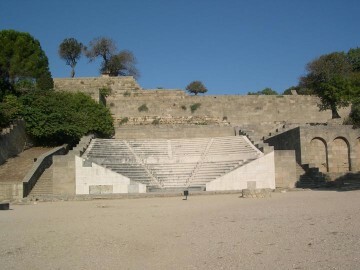 In 1928 G. Jacopi uncovered the lowest row of seats and the west parodos. In 1937 the excavation of the monument was completed by L. Laurenzi.The Odeion was restructured in marble in 1938-1940. The site is open to the public. Music events are organised, in keeping with the character and size of the monument. The monument belongs to the jurisdiction of the Ministry of Culture and Tourism /22nd Ephorate of Prehistoric and Classical Antiquities.